The Martinelli Luce Minipipistrello LED table lamp is an iconic object created by Gae Aulenti. It impresses by the extraordinary look of its opal methacrylate shade which is reminiscent of the open wings of a bat (the Italian term for bat is "pipistrello"). Below the lampshade, a telescopic steel rod forms the bridge between the frame and the shade. This rod simultaneously ensures that the table lamp can be easily adjusted in height. The base of the Minipipistrello LED is offered in three different surface finishes: white, dark brown and copper. These make the table lamp from Martinelli Luce look timelessly elegant so that it is able to blend with numerous interior design contexts. The Martinelli Luce Minipipistrello LED Table lamp is a piece by Gae Aulenti from 1965. 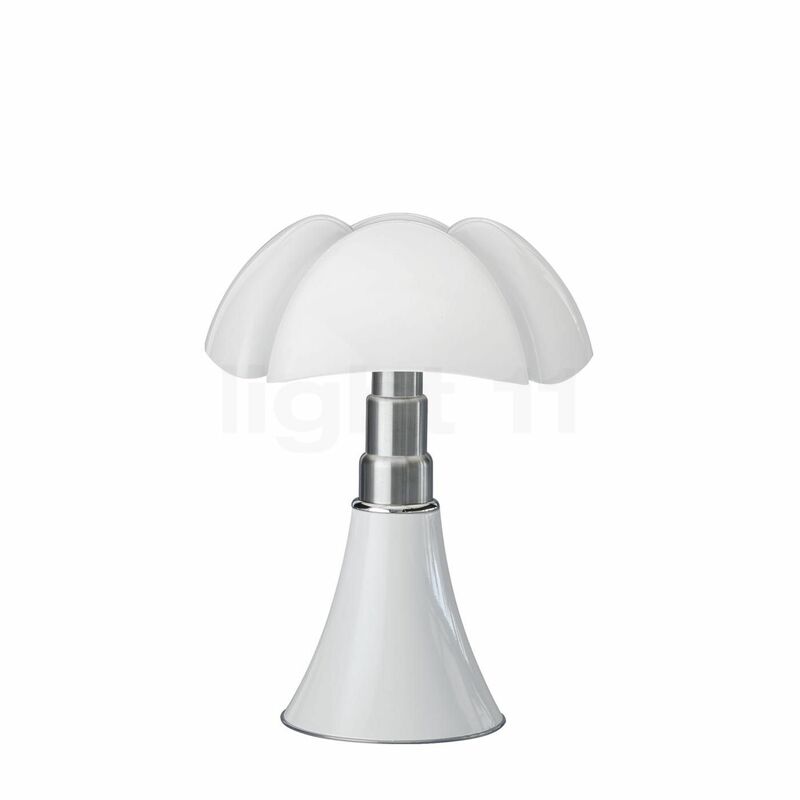 All pieces of a Martinelli Luce Minipipistrello bear the signature of the designer Gae Aulenti. The iconic shade of this table lamp reminds us of the silhouette of a bat. The shaft adjustable in height merges into the trumpet-shaped base. 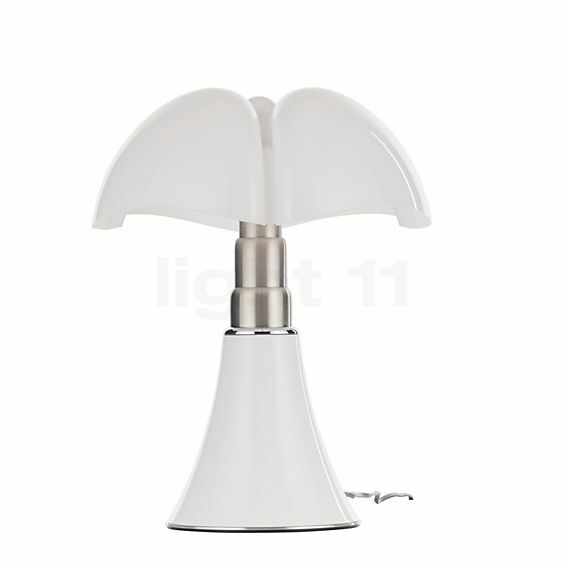 As soon as the Minipipistrello LED table light is switched on, its opal white shade softly diffuses the light downwards. This way, the table lamp from Martinelli Luce offers pleasant zone lighting with a light cone that can be adjusted as required. Moreover, the Martinelli Luce Minipipistrello LED makes use of economical LED technology to produce its warm light. This table lamp only requires nine watts to produce a luminous flux of 700 lumens which almost corresponds to the light intensity achieved by a classic 60 W incandescent lamp. The Minipipistrello LED can be obtained with a switch or a touch sensor. If you opt for the latter, the table light can be switched on and off by touching the lamp’s base. Tell other customers and us about your experiences with the Minipipistrello LED Table lamp ! Being a timelessly beautiful classic, the Martinelli Luce Minipipistrello LED can be used in many different places. For instance, on a side table next to an armchair or a sofa in the living room where this table light additionally serves as an eye-catcher and a reading light. Alternatively, it is also a good solution to supply reading light on the bedside table in the bedroom. Moreover, the Minipipistrello LED from Martinelli Luce provides for a tasteful highlight on a commode or a sideboard which allows the respective piece of furniture to be ideally emphasised.